Hello dear foodies! 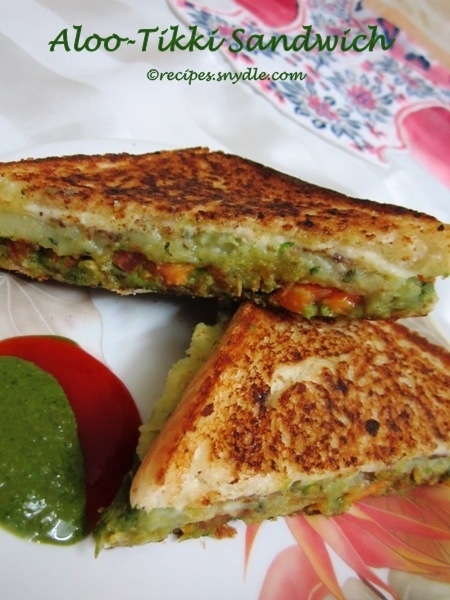 I am back again after a long break and this time with a yumilicious sandwich recipe! Like I said before, sandwiches are a quick fix to your hunger pangs. You can create a sandwich out of anything if you have the basic ingredients at hand. This time I made Aloo- Tikki Sandwich. Potato sandwiches are too mainstream, and so I decided to first make a delicious patty with a nice crust so that it would add substance to the sandwich. Since I did not add anything spicy in the patty mixture, I used spicy mint-coriander chutney to fill that void. I strongly feel that you cannot make a good sandwich without cheese. So I threw in some cheese. I used shredded cheddar. You can use cheese slices as well. What more went into those perfectly toasted slices of bread will a mystery, unless you go through the recipe. For the pupose of measurement, 1 cup = 250 ml. This recipe will yield 4 sandwiches. So let’s get started now. In a mixie jar, take all the ingredients for the chutney and grind them to a smooth spreadable paste. Add some water if it looks too thick. Remove the chutney to a bowl and reserve it for later use. You can make the chutney ahead of time and refrigerate it for 1-2 days. You can adjust the amount of jaggery and tamarind. The taste must be well balanced. In a mixing bowl, mash the boiled potatoes. Add in the salt, amchur / dry mango powder, corn starch, garam masala and coriander leaves and make a firm mixture. Divide the mixture into four parts. If you are using buns, you can make round patties. Since I used bread, I shaped my patties square with the help of the knife. You can choose to shape your patty anyway you like. Heat the oil in the meanwhile. Beat an egg in a separate bowl with a pinch of salt. Carefully lift the patty and give it a dip in the egg wash. Transfer the patty to the plate containing to the breadcrumbs and coat it evenly. Gently lift the patty and carefully transfer it to the hot oil and deep fry it for about 3-4 minutes on medium flame till it turns golden brown, cripsy and aromatic. Remove the patty onto the kitchen towel to drain excess oil. Aloo-patty usually don’t soak a lot of oil. You can also bake the patties in the preheated oven at 160 degrees for about 10 minutes. If you are a vegetarian, you can replace the egg wash with a medium consistency batter of maida and water to help your breadcrumbs stick to the patty. Keep the patty aside and let’s get other things prepped. Arrange four bread slices on the counter top. Apply butter to the bread slices. This will help prevent the bread going soggy from the chutney. Now generously apply coriander-mint chutney over the layer of butter on the bread. Place the aloo-tikki on the bread. Place the tomato roundels as well. It’s time to add cheese to the sandwich. Pack the sandwiches with the rest of bread slices. You may butter this bread slice as well, if you want. It’s time to toast the sandwich. Grilling might not be the best option since it will press the sandwich really hard, causing the patty to break and become mushy. So just toast the sandwich on a hot girdle / tawa using some more butter. Remove the sandwiches on to the plate when you get the golden brown color. Repeat the same process with other sandwiches. 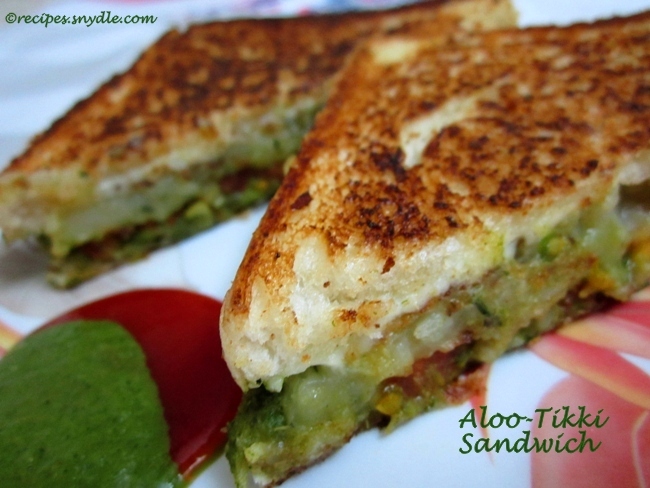 Aloo-tikki sandwich is ready. Cut the sandwiches into halves and enjoy the sandwiches hot with ketchup.